Absent­ly, he reached over the ket­tle and swished the blade of his dirk to and fro in the scald­ing liq­uid, then pulled it out and wiped it clean. “Whyev­er did ye do that, Jamie?” He turned to find Jen­ny star­ing at him. The black curls were com­ing undone from their rib­bon, and it gave him a pang to see the glim­mer of a sin­gle white hair among the ebony. He felt rather than saw Jenny’s eye­brows rise. 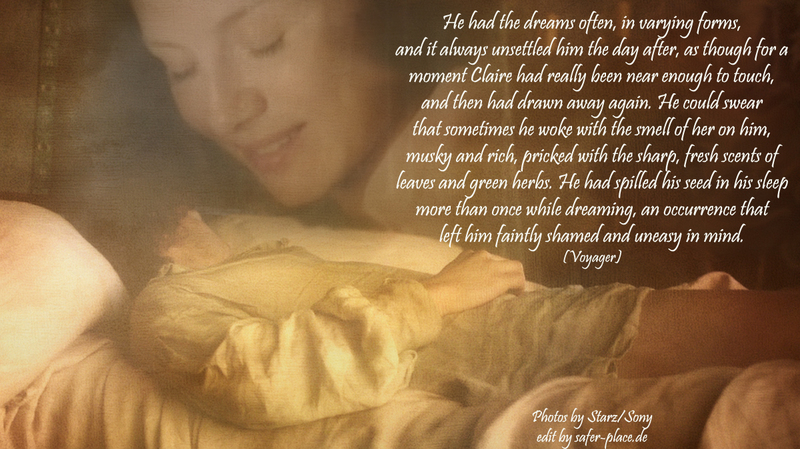 She had asked him about Claire only once, when he had come home from Cul­lo­den, half-con­scious and most­ly dead with fever. “She is gone,” he had said, and turned his face away. “Din­na speak her name to me again.” Loy­al as always, Jen­ny had not, and nei­ther had he. He could not have said what made him say it today; unless per­haps it was the dreams. He had them often, in vary­ing forms, and it always unset­tled him the day after, as though for a moment Claire had real­ly been near enough to touch, and then had drawn away again. He could swear that some­times he woke with the smell of her on him, musky and rich, pricked with the sharp, fresh scents of leaves and green herbs. He had spilled his seed in his sleep more than once while dream­ing, an occur­rence that left him faint­ly shamed and uneasy in mind. It always makes me sad how lone­ly Jamie was.….. He is like a lot of men whom lost their true love and are now alone cause no one will ever replace them. So sad. He suf­fered so.